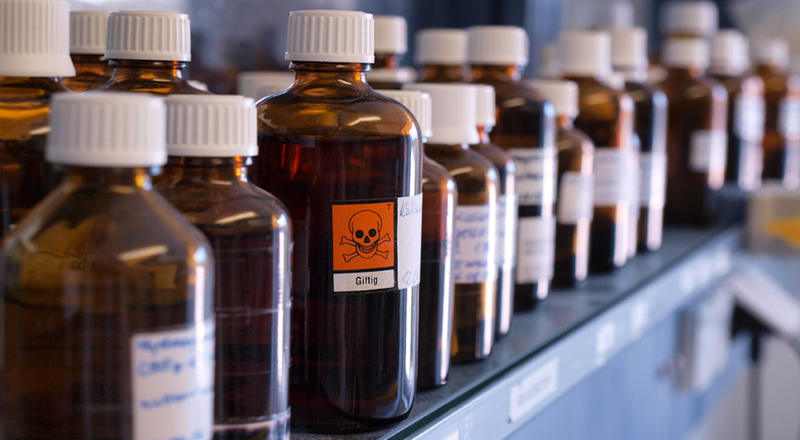 Before choosing a chemical storage cabinet, create an inventory of all chemicals. This inventory should include expected volumes for present and future use. Each chemical comes with a Safety Data Sheet (SDS), which describes its properties. It also includes hazards associated with the chemical and recommended storage practices. Note which chemicals are incompatible and allocate them to separate safety cabinets. It is a best practice to color code your safety cabinets. Employees and emergency response personnel can then identify the types of chemicals inside. Some chemicals are corrosive. Polyethylene trays resist corrosion and keep chemical storage cabinets in good condition for longer. The Occupational Safety and Health Administration (OSHA) and the National Fire Protection Agency (NFPA) set standards for the storage and classification of flammable materials. The International Fire Code (IFC) also provides specific requirements for self-closing doors. Even where self-closing doors are not enforced, this is a safety feature that is often applied. Doors may close automatically when left open or have a mechanism that closes the doors in the case of a fire. All safety storage cabinets must be self-latching with a mandatory 3-point latch. This ensures positive closure of the safety cabinet, protecting the contents in the case of a fire. In most environments, an FM-approved safety cabinet meets the regulatory and safety needs. However, the Navy and other shipping environments require safety cabinets that meet the European standard, EN14470-1. Justrite EN safety cabinets are available for these high-risk applications. OSHA limits quantities of flammable liquids kept outside of safety cabinets or storage rooms. But, insurance companies and local authorities can place even higher restrictions. Constructing cabinets from steel and fire-resistant materials increases the Maximum Allowable Quantity for storage. Justrite makes safety storage cabinets from high quality steel and issues a 10-year limited warranty. OSHA and NFPA use different criteria to classify flammable materials. Always check with local authorities for the standards applicable to you. All safety cabinets should be lockable. Justrite chemical storage cabinets also offer the ability to add a padlock. Drilling into a cabinet to add a padlock compromises the integrity of the cabinet. Clear warning labels must appear on safety storage cabinets, saying “Flammable - Keep Fire Away.” Justrite Haz-Alert™ Flammable labels provide the warning in English, French and Spanish. Labels must be visible in different lighting conditions and at the base of the cabinet. This alerts people crawling through smoke to the contents of the cabinets. Storage cabinet shelving should meet safe loading criteria. They must slope towards the back of the cabinet. Leaks and spills flow downwards off the shelf and into leak proof cabinet sumps. Justrite offers a comprehensive range of safety cabinets for handling and managing flammable liquids, solvents and chemicals. Find the best safety storage cabinet for your specific needs. Within safety cabinets, the shelves are considered bases, since those are what the individual containers rest on within the cabinets. As the EPA rule specifies, sloped shelves are not just about safety, but also an environmental consideration. Obviously, the slope of a surface allows gravity to help funnel liquids to a safe and secure accumulation area. In this case, it’s the sump located at the bottom of our cabinet. NFPA 30 14.4.8 states that lockers shall include a spill containment system to prevent the flow of liquids from the structure under emergency conditions. Safely gathering the liquids in the designed sump calls for a little help from gravity, which is the mindset behind our patented SpillSlope® shelves. Simply put, sloped shelves in safety cabinets go beyond just meeting the minimum compliance regulations. By directing spills into the sump area, it can then be emptied and cleaned using established safe methods and procedures. If the liquid didn’t drain into the sump, instead pooling on the shelves, it would end up creating a larger surface area for vapors to form – and since the vapors are more dangerous than the actual liquid, the consequences could be explosive. We hope this helps. For more information, check out Not All Safety Cabinet Shelves Are Created Equal. Or see our RedBook Guide to Handling Flammable Liquids Safely. Can you give me a reference or standard regarding the sloped shelves by requirement for flammable cabinets? Your information states that “shelving must be sloped to the back of the cabinet”. We are trying to align all our cabinets and I am unable to find that information.I appreciate your help.